Visionary, paddler, backpacker, trail-builder Les Wilcox has circumnavigated Lake Timiskaming. The result of his travels along Ontario's Other Coast is a set of online maps for the canoeist, kayaker, boater or hiker. Fred Eaglesmith will be performing at the Northern Music Festival on the Civic Day weekend. Eaglesmith will bring his roots music to the Cobalt concert from August 1 to 3 to raise funds for the fight against the Adams Mine dump proposed for Kirkland Lake. 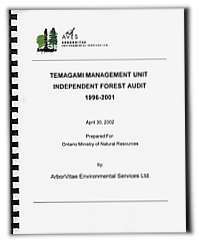 The independent forest audit predicted that the poor forest management in Temagami could lead to a return of the battle over the forest. Although it pointed out other problems, the audit's prediction stemmed from the ineffectiveness of access-road closures. "Failure of access controls may mean failure of key aspects of the TLUP [Temagami Land Use Plan] and ultimately a rekindling of old disputes." The TLUP has been passionately cited by industry supporters to justify logging. The plan specified where industrial and non-industrial activities were permitted on Crown land. Yet forestry has been the only activity fully implemented under the plan. Tourism, recreation, First Nations and ecological implementations have been largely ignored. Local environmentalist Terry Graves called it a "timber management plan disguised as a land-use plan." The TLUP was finalized in 1997 and loudly touted as the answer to local conflict and the bitter controversy, the audit said, "representing local and provincial, national and even global interests." The audit pointed out that access was likely the major issue dealt with in the land-use plan and formed the foundation for its credibility with the public. "The Audit Team is concerned that there may be a substantial risk that the TLUP may lose support of stakeholders due to the poor implementation of access control." The independent audit, commissioned by MNR, was produced by ArborVitae Environmental Services as required by law. The report's timing may be portentous as a new timber plan is expected to be released for public approval in October. The independent forest audit took the unusual step of singling out a logging company, Goulard Lumber, calling it "careless." It was so unusual to name a company that the audit even pointed out that it was done as a consequence of the extreme concern over Goulard's behaviour. In just one logged area, the auditors found that Goulard built a road through a moose aquatic-feeding area, constructed a gravel pit in a sensitive area and built a truck turnaround in yet another sensitive area (aka Area of Concern). Nor were the auditors satisfied with MNR's response. "While MNR states that it does not find the licensee's performance acceptable, MNR has not exercised a sufficient degree of control to force the licensee to upgrade its performance." Goulard of Sturgeon Falls was mentioned in the previous story in this series (see yesterday's story) for its disregard of road closures. The audit attributed much of the failure of MNR enforcement to insufficient personnel. An independent audit on Temagami forestry operations reported a "flagrant disregard for access controls by the public and some members of the industry." It found road gates breached, roads built around gates, and even a case of an industry skidder driving around a gate. The report came on the heels of a damming report by the Wildlands League on the failure of road closures. The audit went a step further and pointed a finger at industry. "There were instances where either non-compliance, poor enforcement of non-compliance, or a failure to heed the concerns of other users of the forest were evident," the audit said of the forest industry. In one example in the report, Goulard Lumber took years to remove a bridge, even failing to immediately comply with a MNR order. When it did remove the bridge, it did so "carelessly." There seems little hope that the problem will be fixed by MNR given its low funding. "Temagami area staff are putting as much effort into access control as can be managed with current personnel levels." It noted that current MNR staff are hardworking and diligent. The report was completed in April, 2002, then quietly tabled a year later in the Ontario Legislature on April 25. Independent audits were commissioned by MNR. Gary Gallon, 57, one of Temagami's greatest and least-known defenders, died of cancer last Thursday in Montreal. Gallon's most important contribution was probably his pivotal role in getting approval for the environmental assessment on the Red Squirrel logging-road extension in 1985. That event led to the escalation of the battle for Temagami in the late 1980s. He also played a major role in the creation of the Obabika and Solace parks in 1988. Gallon was one of Bradley's Brats, the dynamic and relentless cadre of staff around Jim Bradley while he was environment minister from 1985 to 1990. Many informed observers have said that Jim Bradley, due to his remarkable, even activist, record of environmental achievements, was the only environment minister Ontario ever had. From inside the Liberal government, Gallon pressed for Temagami. Some say some of his success came because he had the ear of then-premier David Peterson. Traditional secrecy around Queen's Park decisions meant that Gallon's role was never known. Contrary to the public image of ministerial staffers as career party stalwarts, Gallon was a former environmentalist who helped found Greenpeace. He is survived by his wife Janine Ferretti and daughters Kalifi and Jenika. The Ontario government pushed new rules through Cabinet that increase clear-cutting, reduce old-growth protection and eliminate preservation of our last roadless wilderness. An Earthroots activist, posing as Ernie Eves, stripped to his briefs on a major street near the Legislature, according to the Toronto Star today. Another activist, dressed as a logger, threw Monopoly money on the stripper. Wildlands League and Federation of Ontario Naturalists report that thousands of Ontarians objected to the regressive steps. "The Ontario Cabinet is putting short-term wood supplies to industry ahead of the long-term health of our natural forests and all the species that depend on them,” said Chris Henschel of the Wildlands League. Over 90 per cent of logging in Ontario is on public lands, an area larger than the state of California, and 90 per cent of that logging is clear-cutting, so the impact will far exceed the implied small consequence these low-profile laws imply. The new laws were passed late Friday, a tactic used for bad-news announcements to ensure a low profile in the news. The impact will be particularly felt in Temagami that is significant for its old growth and roadless wilderness with its proximity to Toronto, and because clear-cutting will freely increase in an area where clear-cutting has not been the predominant cutting method. "It is deeply troubling that this government seems unwilling to put community stability and environmental protection ahead of commercial interests,” Henschel concluded. Nastawgan Trails plans to create a hiking trail along the dramatic eastern shoreline of Lake Timiskaming and link up with trails in Temagami. The northeastern Ontario trails organization has done initial exploration along the Temiskawa (Temiskaming and Ottawa) Waterway and uncovered sections of old trail, campsites, artifacts and old logging-facility ruins. The group hopes to eventually link the trail with other trails along the waterway, for which a heritage waterway designation is being sought. Engineering studies have shown Shiningwood Bay to be a superior site for the new mainland community being negotiated in the land-claim settlement, according to the government negotiator, Doug Carr. Shiningwood Bay and the larger Strathcona Road site, near the town of Temagami, were under consideration. Strathcona had been the frontrunner with negotiators. Shiningwood is now the site included in the draft settlement. A mainland community site is one of many elements in the complex agreement. Temagami Forest Products has received a license for a white-birch mill in the town of Temagami. Urban residents have been holding out the hope that the new mill will stem the decline in population. The viability of many retail businesses, and even the primary school, is threatened. The facility will be built on the former Wm. Milne sawmill site and is expected to employ up to 60. This will be the first industrial facility in Temagami since Milne closed in 1990 and marks the return of the forest industry to the town. The mill will annually use 30,000 cubic metres of birch from the Temagami management unit, provided by other cutters, and 10,000 cubic metres of wood purchased elsewhere. The mill has no cutting rights of its own. The approval was not without contention. A condition of the approval set by MNR had been First Nation involvement, but a close reading of the actual wording of the proposal was required to appreciate that the devil was in the detail. It said: "demonstrate commitment to provide opportunities for local First Nations people." There was no actual commitment. The only objection to the approval during the public comment period was from the excluded Temagami First Nation. A campaign has been launched to gain Heritage River status for Lake Timiskaming and the Ottawa River. A Heritage River receives attention and some new protection through joint provincial-federal recognition of the river and provides a tool for groups seeking both for the waterway. The Ottawa River Heritage River Designation Committee, which is promoting the status, has named the river the Temiskawa Waterway.